I’m spending part of today getting ready for my METC presentation next week. And as part of my presentation prep, I’m exploring what it really means to integrate technology. I started with the idea that just because teachers or their students use technology as part of teaching and learning, doesn’t necessarily mean that they are actually integrating technology into what they’re doing. Though some schools are moving to Chromebooks, many are still effectively using iPads in 1-to-1 settings or off carts. And it’s always nice to have a few new iPad tools lying around to experiment with. These five apps are some of my latest favorites. Later this week? Five helpful Chromebook apps and extensions. Collect, sort, and share student responses with actual paper sticky notes. Open Post-it Plus and create a new board. Then snap a photo of one or multiple sticky notes. Post-it Plus digitizes them, allowing you to sort the notes and share the board as a PDF. A fun way to do word sorts, vocab review, or to brainstorm. Have you always wanted to create your own video game but never knew where to start? Floors offers a simple way to create & play games – you and your kids use specific shapes on graph paper, then use the app to take a picture of your creation, and the app creates your games based on those shapes. Get free lesson plans at their website. Bloxels works in a similar way but uses colored blocks on a matrix instead of drawn shapes. Both are perfect tools that can be used to blend literacy, STEM topics, and social studies content at different grade levels and disciplines. Designed to look and seem like picking up a notebook, Paper has a handful of powerful tools that enhance the sketching experience. It’s fantastic for doodling and exploring ideas, creating beautiful illustrations, and emphasizing handwriting skills. You can sketch images and notes onto the app, and combine them with written text, photos, or checklists. 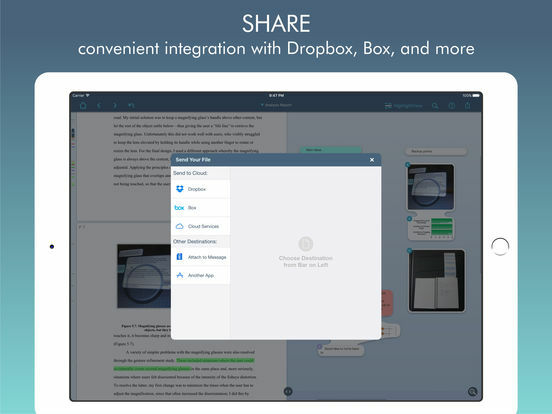 It also comes with features for sharing your drafts with colleagues as PDF, Keynote or Powerpoint files. A great way to incorporate Sketchnoting into your classroom. LiquidText offers a fast, tactile way to review, gather, and organize information across all your documents and webpages – then apply the results to writing reports, meeting prep, or simply studying. Pull out key facts and connect them together, squeeze a document to compare sections, comment on multiple pages at once, build upon your thoughts, and much more. Maybe you missed this. Maybe you’ve been following the presidential election or the Brexit thing or bemoaning the fact that the 2015 World Series champions have lost seven of their last ten games and are now seven games back of Cleveland. You know, something trivial. So let me catch you up. A free mobile phone app just changed the world. If you’re not spending time on the Graphite web site, uh . . . what are you doing instead? Because I’m gonna suggest that you’ve got a problem with your priorities. Looking for a handy site that helps you locate useful apps, games, and websites that also provides ratings and reviews? That also includes teacher feedback? That has awesome search and sorting functions? That organizes all of its goodies by Common Core – giving you the chance to find activities aligned to ELA literacy standards for history?
. . . a free service from nonprofit Common Sense Education designed to help preK-12 educators discover, use, and share the best apps, games, websites, and digital curricula for their students by providing unbiased, rigorous ratings and practical insights from our active community of teachers. Their team of professional educators – early childhood development experts, doctorates in education, and teachers with hands-on classroom experience – rates each website, game, and app on Graphite based on their detailed rubric. Every product on Graphite is rigorously reviewed to dig deeper into what and how your students will learn with it.